California has a cannabis-friendly attitude and a climate perfect for hemp, but regulatory confusion in the Golden State means that entrepreneurs have yet to realize any profits from legal hemp – and a pending bill could make matters worse for establishing the plant as a commodity crop. “It’s just complete chaos,” said Christopher Boucher, who co-owns Farmtiva with CBD manufacturer Isodiol International. 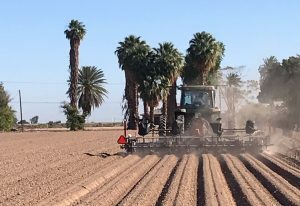 Farmtiva recently planted 60 acres of experimental hemp in Brawley, a Southern California desert town about 30 miles north of Mexicali, Mexico. Boucher’s experimental hemp, growing on land owned by an independent agriculture research center, is the first state-approved hemp that has gone in the ground since voters approved hemp cultivation in 2016. No licenses have been issued yet to private farmers for hemp cultivation in the state, though low-THC plants that could probably qualify as hemp are thought to be growing on the black market. Allow cities and counties to levy additional fees and taxes on hemp producers, with no limitation. Require hemp growers to submit proof of seed certification to state agriculture authorities along with samples for THC testing – even though California has not certified any hempseed cultivars. “This is not a bill to support farmers,” said Wayne Richman, executive director of the fledgling California Hemp Association. Speaking at a recent hearing by the California Industrial Hemp Program, a task force set up within the state’s Department of Food and Agriculture to establish a hemp program, Richman noted that California seems determined to hold off hemp cultivators in favor of marijuana growers. One reason for the observation: Some of the proposals have been driven by concern that pollen from male hemp plants could reduce THC content of flowering cannabis females grown for THC content from distances as far as 80 miles. “The cross-pollination language in this measure, we’re being kind of rebuffed,” Richman said. And local governments are being given too much leeway to ban hemp. Even the chair of the California Industrial Hemp Program board agreed. The bill “seems to favor more the recreational marijuana” over hemp, said Lawrence Serbin, founder of Hemp Traders, a company near Los Angeles that claims to be the nation’s largest importer of hemp fabrics and fibers. Another task force member, John Roulac, said California’s hemp rules are shaping up to be some of the strictest in the U.S. – and even globally. “California does have one of the strictest hemp regulations in the world, which is frustrating for me as a hemp entrepreneur,” said Roulac, who is CEO of Nutiva, a Bay Area company that makes organic food products. While the hemp bill is pending in the California Senate, the state is expected to miss another year of large-scale commercial production in 2018. Boucher’s 60 acres are thought to be the only licensed hemp plants anywhere in the state. California’s regulatory delays mean that California hemp farmers currently experimenting with low-THC cannabis are still in the black market, because there’s no state pilot program, he said. This is just bad botanical science! The way hemp pollen fertilizes the female plant is very localized. Many hemp farmers use feminized seed and clones.And the proximity of industrial hemp to a recreational cannabis grow op would have to be next door !A non-issue if you ask me! moving to Nevada, by far a much easier and more progressive state to grow Hemp. Perhaps California could model it’s Hemp program after Nevada’s much more favorable Hemp program? In the meantime We wish Chris Boucher great success with this project! All the best Chris! Do you need/want a lobbyist @ the CA legislature? Why ask for a back ground test to grow hemp?